If you have a baby duck and you plan to raise them, you must have wondered what to feed these baby ducks. 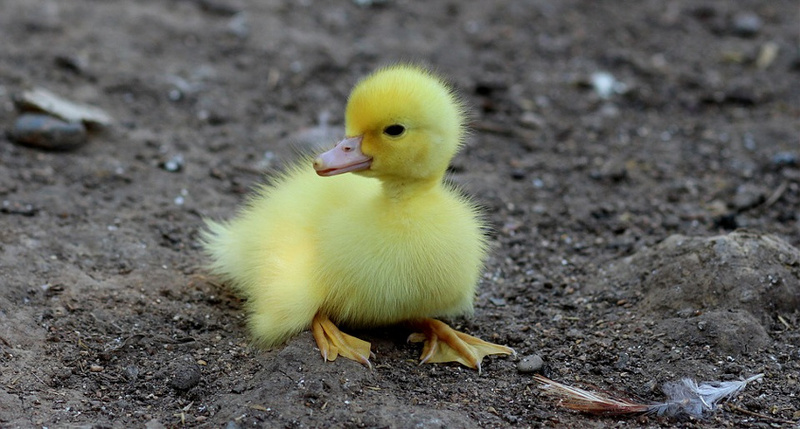 There are things that you should know about baby duck care before you start. Foods like Pro Duck Startergreens, cracked corn and carrots are great for ducklings. To begin, these little ducks need warm and safe environment to live and grow. It is important that you keep watch on them as these ducks are sensitive for first few days of their life. Little ducks will start swimming as soon as they are born and they like water as they are happy little swimmers. If you want to know more please read below. Make a brooding container for them. Little ducks will start eating 24 hours after they are born, so it is important to place them next to the source of food and water. You can use a plastic container or a box for this, if you have just a few ducks. Because ducks cannot jump out of the container they will be safe even when you are not there. The box should be well-insulated so as to provide them warm air all the time. Keep the box in the warm place. To make your ducks feel great, line the bottom with old towels, or other soft material. Ducks like the touch of soft material under their legs. You can place even soft grass or straw. When ducks are small and young, they need warm environment to grow, this can be done by installing a heating lamp over the box. This will keep them warm at all times 24 hours a day, and never turn it off. For few ducks one lamp is good enough, if you have lots of baby ducks install few more lamps. Warm box is important for baby duck care. 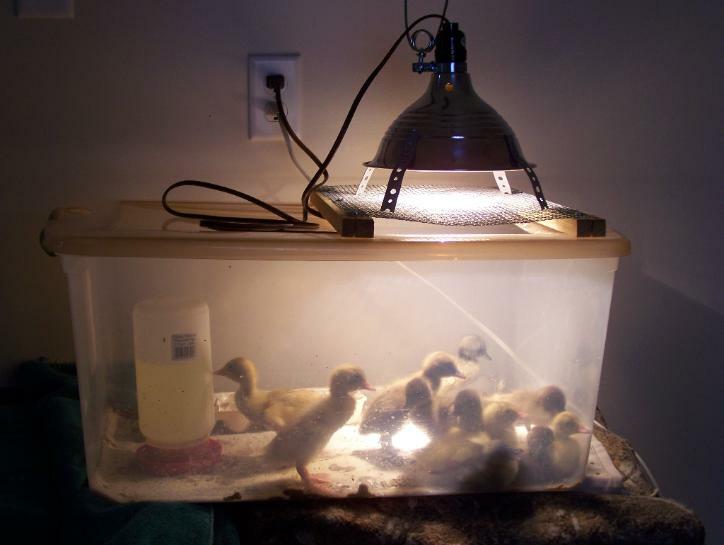 For newborn baby ducks 100-watt bulb is a good start, it will provide the heat for keeping them warm. Install the bulb in such a way that it is in the corner of the box, because ducks can move away from the heat if needed. It is best to install it a little higher as ducks cannot touch the bulb and burn them self. You can leave the light on 24 hours, so ducks have the source of heat all the time. If it's summer time, then you don't have to provide extra heat, you can even overheat the ducks by providing bulbs in summer time. Baby Duck Food, What To Feed Baby Ducks? You can provide them Pro Duck Starter feed, peas, cracked corn, green beans, lima beans, cooked carrots, tomatoes, worms , hard boiled eggs, grass. 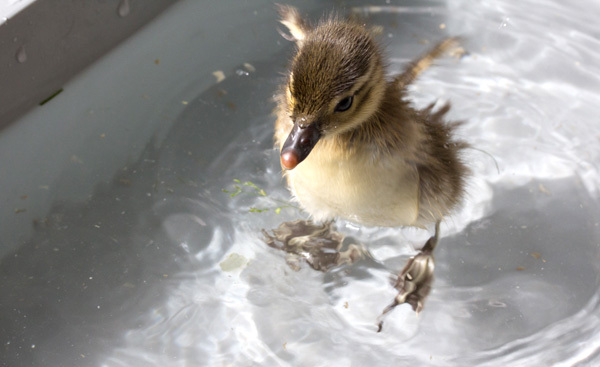 What Equipment Do You Need To Feed Ducklings? Ducklings, like all other creatures love companionship and will do their best when they are in company of other ducks. If you plan to get a pet duck I would recommend you to get a pair. You will not be around always and this way they will have each other for company. Even after having two ducks they will express love for you, but they won’t be lonely when you are not around. If you plan to keep multiple duck for egg production then the number of ducks you want to have is up to you as long you can provide good housing, food and clean environment. You can easily keep 12-15 ducks in your backyard; just make sure they are protected from predators and cold weather. Remember that all ducks need the same thing to have a happy life for longer period like good healthy food, access to water and secure housing that is clean. If you manage to provide all this along with some love and attention you can be sure that ducks will shower you with love. Ducks are very good at remembering faces and can recognize owners and their voices. When ducks see you they will often run towards you to greet and say hello. If it is possible let the ducklings have some space outside to walk-around. Make a small fenced area that is protected from predators and let the ducks peck around the grass. Don’t do this until baby ducks are at least 2 weeks old. Exposing the ducklings to the outside environment will stimulate their growth and make them come in contact with normal bacteria that will help them build up immunity. Ducks are great companions and produce good eggs. If you like chicken eggs you will love duck eggs even more. Free-range duck eggs are rich in all the good nutrients like protein, calcium, iron and potassium even more than normal chicken eggs. Everybody that tried free-range chicken or duck eggs knows the difference in taste. Ducks that are allowed to walk around freely will have a more balanced diet. They will consume veggies and insects apart from eating the food you provide. If it is possible let your duck friends enjoy the sun and grass and you will not regret it. The best option is to buy or construct the enclosure that can be installed in your backyard, this can be a permanent one or removable. This way you can bring ducklings outside and let them have fun in warmer climate. You can even keep ducks outside all the time. Get the water container and feeder installed inside so ducks can always have access to them. Remember not to expose ducks to direct sunlight and provide shade, so little creatures do not get overheated and suffer. Ducks love to swim, so provide them with a water container or a pound where they can happily socialize with their friends. Plastic, metal or wooden containers are perfect, as long as the ducklings can climb up as well as swim around in the water. Don’t forget to provide larger swimming area if you keep more duck; they love to go in the water and swim so let them do it in group, as ducks are good swimmers you don’t have to worry about them drowning. Just allow them to have some fun with water and they will love you for it. Baby duck grow fast and after few weeks you will see great improvement, so keep the food bowl always full and next to water so they can wash it down. When the ducks grow and mature you will switch to adult food. This is when they are 16 weeks old. Never give ducks human food, it is not made for baby ducks, and may lack nutrients needed for growth. I hope this helps and you learned something about baby duck care.